Nowadays the company Archaia Brno, o. p. s. is focused from the professional point of view mainly on rescue and advance archaeological excavations and building-historical research of endangered historical monuments. It is also trying to appeal to the preservation of historical monuments aiming to maintain a maximum of archaeological and architectonic sources, or at least to enforce as best as possible research and documentation before their destruction. Besides these two tasks the company’s professional activity is represented by processing of excavation results into scientifically usable finding reports and their enabling in professional literature. The employees of the company participate in several scientific grant projects, perform publishing activity and regularly take part in home as well as foreign expert conferences, above all on medievalistic topics (Archaeologia historica, Archaeologia technica, Dějiny staveb /Building History, Záchranné výzkumy na Moravě a ve Slezsku /Rescue Excavations in Moravia and Silesia, Přírodovědné metody v archeologii a antropologii /Scientific methods in Archaeology and Anthropology a. o.). Since 2002 the company has been organizing also its own conference FORUM URBES MEDII AEVI (FUMA) devoted to various topics of urban archaeology. Besides research activity the professional workers try to further develop and make more effective the methodics of field research and the processing of its results. For this purpose they create both the standards for particular working and documentation procedures, and a special software for the evaluation of results of field excavations and data archiving. Significant is the cooperation with the Institute of Archaeology and Museology at the Faculty of Arts of the Masaryk University in Brno. Archaia Brno performs here a block of lectures for archaeology students focused on the methodics of field research and its legal, organisation and ethic questions. The company offers to the students of the said institute material from its own excavations to be processed in form of seminar and degree thesises, which contributes to an early evaluation thereof. The professional workers act at the same time as consultants of assigned works. At the rescue excavations organized by the company many archaeology students also obtain valuable practical know-how. 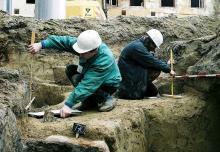 Within the framework of the project Area brunensis the employees of the company Archaia Brno perform a systematic scientific work on revealing the historic topography of medieval Brno. The project is of interdisciplinary character with many professional workers from another institutions involved.